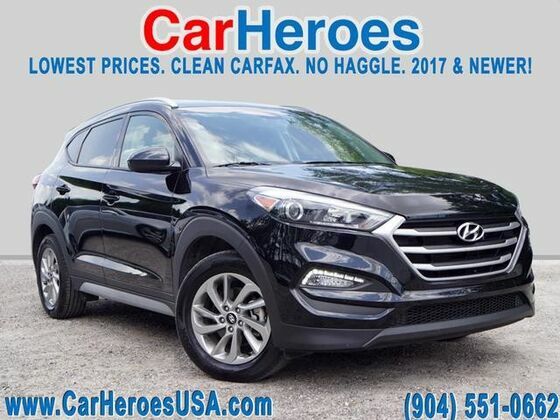 Contact CarHeroes today for information on dozens of vehicles like this 2018 Hyundai Tucson SEL. This Hyundai includes: BLACK, YES ESSENTIALS CLOTH SEAT TRIM Cloth Seats BLACK NOIR PEARL *Note - For third party subscriptions or services, please contact the dealer for more information. * Your buying risks are reduced thanks to a CARFAX BuyBack Guarantee. This versatile SUV is perfect for families or contractors with its oversized cargo area, exceptional horsepower and option upgrades. The Hyundai Tucson SEL will provide you with everything you have always wanted in a car -- Quality, Reliability, and Character.